While the use of antidepressants during pregnancy is not a new topic, it continues to be a growing concern for mothers all over the world. 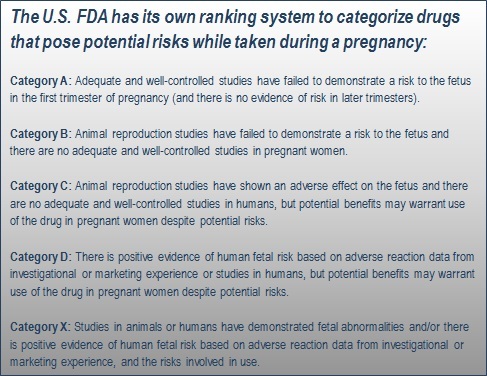 Though the U.S. Food and Drug Administration does not entirely discourage women from using antidepressants, it has issued a warning that use of certain SSRI’s (selective serotonin rebuke inhibitor) during pregnancy carry a risk of causing serious birth defects. SSRI (selective serotonin rebuke inhibitor) antidepressants such as Prozac, Paxil, Zoloft, Celexa, and Lexapro are commonly prescribed medications used in the treatment of depression. While it is often safe for women to take these medications during their pregnancy, there still lies a risk for the baby. A study done by a Danish research group in 2005 found a significant risk of heart malformation in children born to women who took antidepressants. The study showed that babies born to mothers who had filled prescriptions for more than one SSRI medication had a fourfold increased risk for developing septal heart defects (malformation of the wall that divides the left and right sides of the heart). The research compared the incidence of birth defects among more than 400,000 children born to Danish women who took antidepressants and women who did not take antidepressants during their first trimester of pregnancy (first three months). According to the data collected, 0.5% of children born to mothers not taking medication developed septal heart defects, and 0.9% of children born to mothers who did take medication developed septal heart defects. Common SSRI antidepressants that fall under Category C include: Zoloft, Celexa, Lexapro, Prozac, however another SSRI, Paxil is classified as a Category D medication. At the law offices of Altman & Altman we understand that coping with a birth defect can be devastating both emotionally and financially. Our Boston Personal Injury Attorneys have the tools and experience to help you take care of your loved ones, and we stand ready to aggressively advocate for your rights. If you or somebody you know has taken an SSRI antidepressant and given birth to a child with any of the congenital defects listed above, do not hesitate to call us for a free confidential consultation. You may be entitled to compensation by filing a SSRI antidepressant lawsuit. In addition to having a strong record of results, we pride ourselves on being easily accessible to clients. Our phones are answered around the clock, and all emails get immediate responses.